So, if you have mint in your garden you know how quickly it can take over! 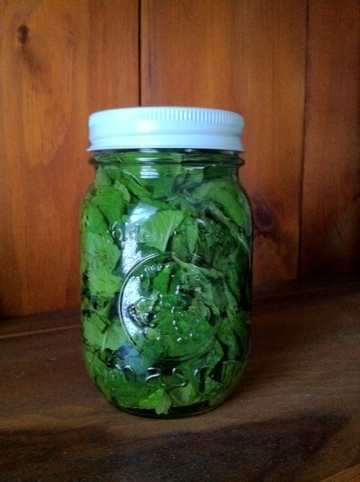 We love having fresh mint! We all like it in our water. 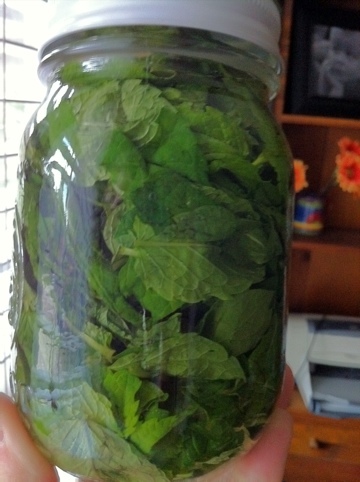 When i brew green tea for us to enjoy iced (unsweetened) i put about 3-4 mint leaves per quart of tea i’m going to make. We love it! Look at all those leaves in there!! You simply crush yout leaves some and fill the jar with vodka! Let it sit for weeks, some say in the sun. Some suggest to shake the jar now & then. So, we’ll see how this goes! oh, forgot to mention…i’m making vanilla extract next! as soon as the beans arrive.